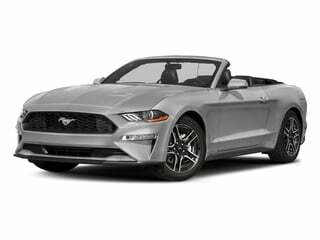 Be the first to review this 2018 Ford Mustang. The 2018 Ford Mustang benefits from a major refresh, with significant changes in styling, drivetrain, suspension, and interior. It’s better looking, the V8 is more powerful, the EcoBoost turbo four is improved, and there’s a new 10-speed automatic transmission. The V6 is retired after faithful decades of service. The Mustang is smarter than ever: more capable, more fun, better balanced, and faster. Styling changes, with redesigned grille and hood, are subtle but make the car striking. The 2018 Mustang draws stares, casual observers noticing something has changed. The cabin is cleaner, at least the optional upgrade is, and interior materials better. There’s also an optional digital instrument cluster and active exhaust. The two EcoBoost models use a new 2.3-liter turbocharged four-cylinder that makes a superb 310 horsepower and 350 pound-feet of torque. The two GT models use the brilliant 5.0-liter V8 that now makes 460 hp and 420 lb-ft of torque (increased from 435 hp and 400 lb ft). With either engine, you can get a six-speed manual transmission, or ten-speed automatic. Adaptive suspension is available on every model. It uses dampers with magnetic fluid, and allows a driver to set the ride at soft for around-town comfort, or firm for sharp handling. The Mustang is just catching up to the Camaro that’s been using these advanced shocks for years. The new active exhaust is available on the Mustang GT. Its sound level can be set by the driver. It transforms the car’s character, and makes acceleration fun. We think it’s worth it. There is a 12-inch digital instrumentation display available on the top two trims. Most of the information is driving data. It’s a beautiful interface, not sprawling like the Audi’s, and the gauges can be configured by the driver, for example shift lights. It’s especially useful with the Track Apps performance package. It’s something that the Camaro and Dodge Challenger don’t have. The 2.3-liter turbo hardtop with the 10-speed automatic gets 21 mpg city, 32 highway, 25 combined, the convertible gets 2 less mpg. Also 2 mpg less if with the Performance Pack for the engine. The 5.0-liter V-8 with the 10-speed automatic gets 16/25/19 mpg. 2018 Ford listings within 25 miles of your ZIP code. Find 2018 Ford listings for sale near you.